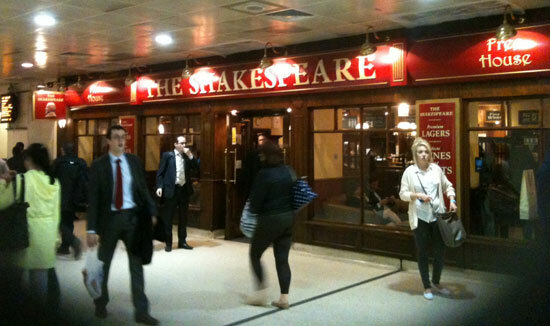 In a break with the old tradition of many major British train stations having a pub somewhere on the platform – The Shakespeare is closing down and there’ll be no new train station pub at Birmingham. Since Wednesday they’ve been selling stock at 20% off to get rid of it all! It’s owned by SSP Travel and I hope the staff all get new jobs in other outlets at the station. But TBH it never looked that inviting. Always mass-produced lager deals on. I’m just gobsmacked there’s not going to be a Birmingham Tap. OPPORTUNITY MISSED OR WHAT??? Here’s what the new bit looked like today. 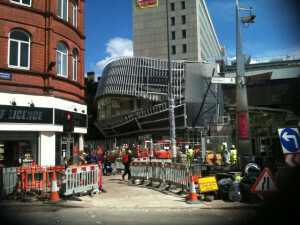 They reckon they’ll be handing over the keys on midnight Saturday, ready for opening to the public on Sunday! WOW! So back to the beer! Here’s your list! Come out of the station, bear left onto Stephenson Street, left again onto Navigation Street until you get to the corner of Station Street and John Bright Street. It’s a 5-10 min walk, if that. What’s it got? 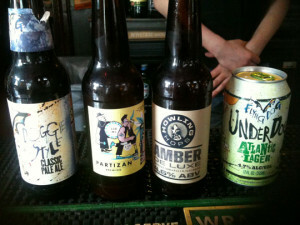 Amazing beers, British cask and foreign bottles and US cans! Soul food menu. Atmos? 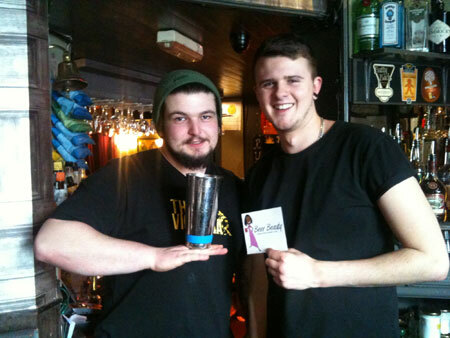 The most amazing staff, I met Elliot (Pricey) and Elliot (Bluqu). Those boys love their beer, they are massively passionate about it and are bounding with energy to suggest beers for you to drink. Elliott & Elliott (nicknamed ‘Bluqu’) from The Victoria. Top beer-lovin’ lads! They gave me a couple of beers samples: Geek Unique from Birmingham’s newest microbrewery, Beer Geek is dark, raisin-like and low-hopped so tasted like a Mild. At 4.3% it’s very drinkable. Hardknott’s Duality packed full of lime flavour, with a fresh meadows aroma: I couldn’t fault it. Well, Hardknott Dave can do nothing wrong, in my eyes. 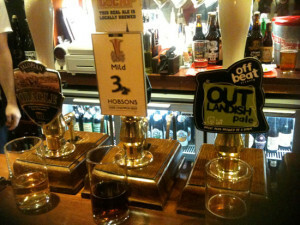 The pub has three guest ales, and they always have Herefordshire brewery Wye Valley’s Butty Bach on. Atmos? DJ sets on a Friday and Saturday night. 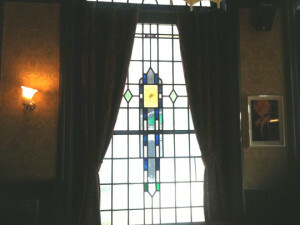 It’s dark (but when it’s sunny the light streams through the amazing (original) stain-glass windows. It’s got a warm, cosy feel, with funky background music playing at a low-level, I don’t remember seeing wall-mounted TV screens. It’s a sassy mixture of traditional and down-right modern. 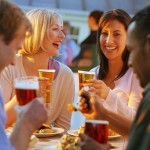 Stunning beers, mouth-watering food menu. The epitome of cool. Get down there. NOW! 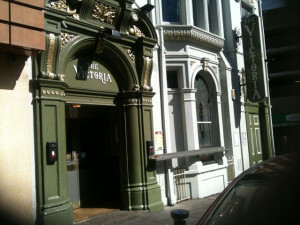 Come out of the Victoria (!) turn right past The Alexandra Theatre, and it’s 2 minutes up the road on the left hand side. You can’t miss it! What’s it got? What hasn’t it got? 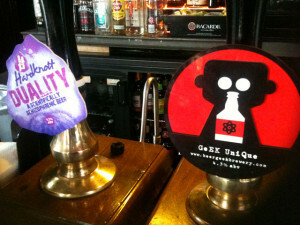 Brewdog beers on cask plus a crazy selection of foreign beers. Atmos? An industrial feel, metallic fittings, tall tables and stools, with some American diner-style booths upstairs and a cute little area downstairs under the metal staircase with comfy old leather sofas which makes families & kids welcome. Food? burgers, wings, meat and cheese boards. Lip-smackingly good! Live music sets on a Sunday night. Check out the pics on their Facebook page. Atmos? Light-airy, no background music, one room, relaxing, tranquil, friendly. 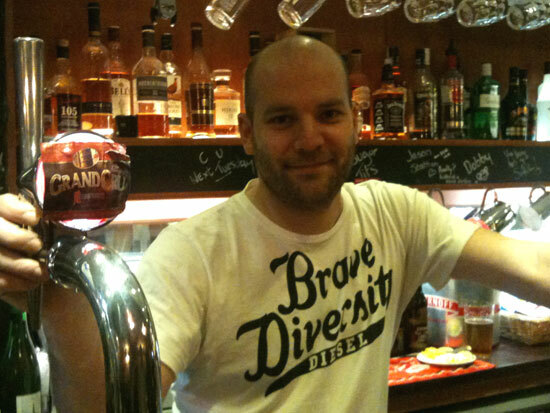 I chatted to licensee (and former Science Teacher!) Chris and his other half, Sharon. 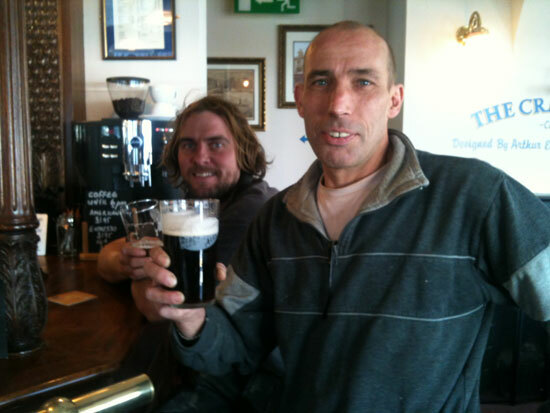 Also bumped into the jolly three J’s (Joe, Jez and Julian) builders from Leicestershire who persuaded me to have a beer with them. Thank God they left before me, otherwise I’d still be there chatting to them now! 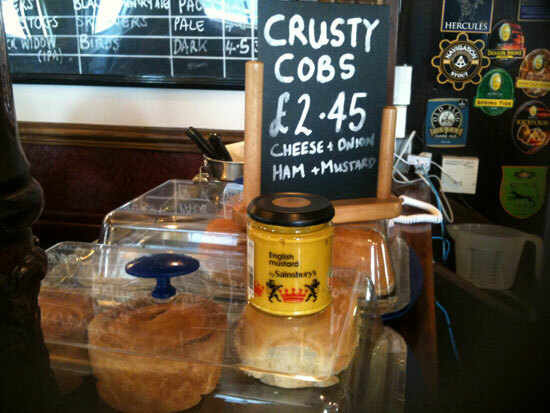 No kitchen for hot food, they sell crusty cobs and – on Thursdays and Fridays – they get a delivery of local, freshly-made pork pies. 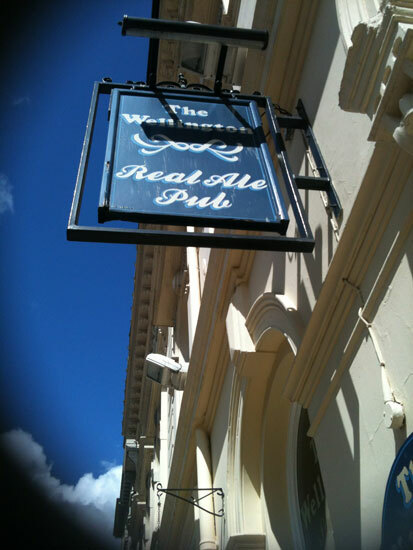 Mad fact: the pub’s licenced to open from 0830 – 0430 (! ), a legacy from its connections to the former Royal Mail sorting office which was nearby and has since become the Mailbox shopping complex. It’s easier and faster to walk out along to the front of the Mailbox, go back up past the station exit along Stephenson Place and sneak up to the pub’s Pinfold Street entrance! 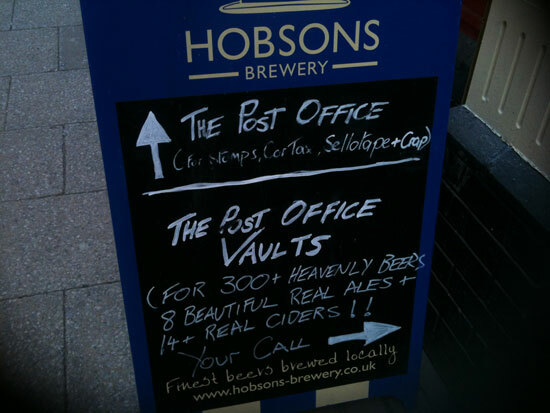 And luckily for the PO Vaults, the main entrance of the station is ridiculously close to that very street! Genius, eh? Atmos? It’s dark, down the bottom of some stairs. But nevertheless it’s cute, cosy and cheery. I love this place. 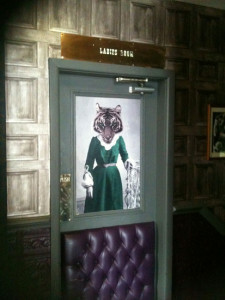 Read my review and listen to my interview with the licensee, Mike! 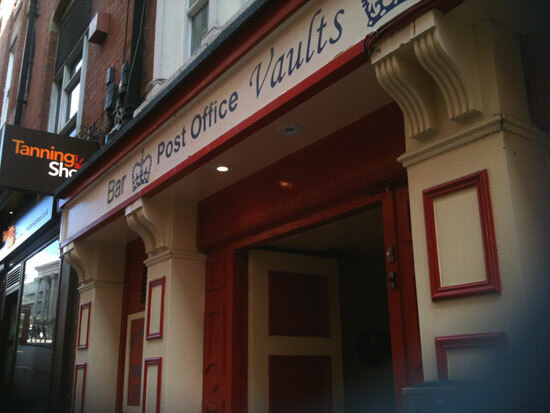 Come out of PO Vaults onto Pinfold Street and take a right up the hill to the corner, go left past Supercuts hairdressers on the the right onto New Street and down the pedestrianised hill. Bennetts Hill is the second on the left. There’s a Nationwide on the corner, walk up past that to the top of the road, cross over and then the ‘Welly’ as it’s affectionately known is on the right. What’s it got? A ruck of beers: 15 handpulls, an expansive foreign bottles fridge section and they do a very decent line in ciders (if that’s your bag). You need to order your beer by its corresponding number on the flat screen wall-mounted TV. No kitchen, and no food served at all but you can bring your own food in!!! BONUS! Atmos? No music, so quiet contemplation is the order of the day here, except for the Dartboard Corner which can get lively sometimes! 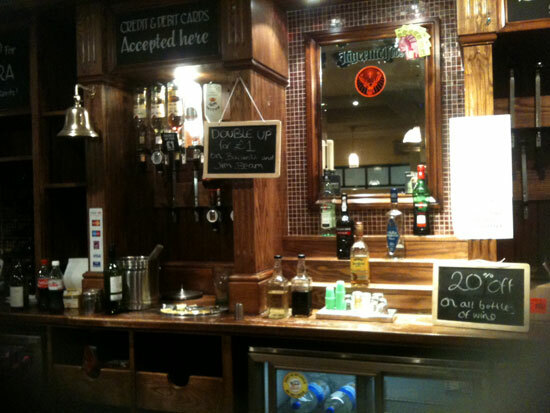 It’s got a cute little beer garden in the back, which backs onto The Old Joint Stock (see below! 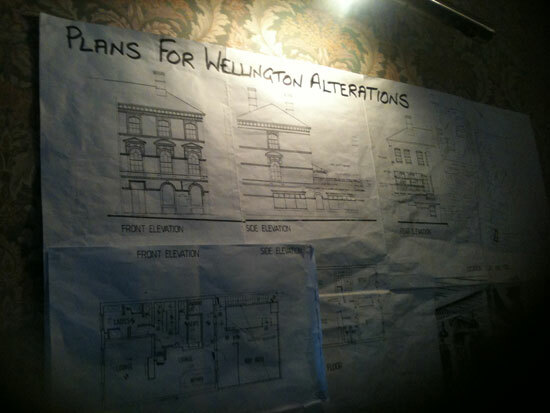 The Welly’s being refurbished right now, to add in a roof terrace. Nice touch of Nigel to make the plans available on the wall for drinkers to check out. I met new chums, Lucy (beer lover) & Sarah (cider lover) who were having a meeting. A likely story, Ladies! 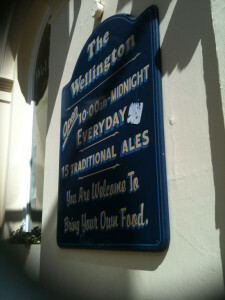 Walk out of the beer garden of The Welly and over into the Beer Garden of The OJS. Saves you having to walk around the block to get to it! This is a Fuller’s pub. This is the furthest north this West London brewery goes on its pub estate and, boy, aren’t we lucky? 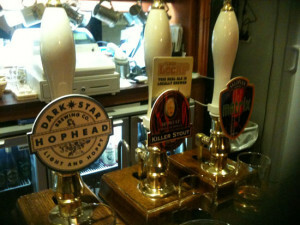 The bar is packed with all their star beers (London Pride, Honey Dew, ESB and many more, it has at least 5 guest ales on!) PLUS it’s a theatre – packed full of terrific local productions, an absolute must. Put it this way, I had a massive birthday party there, I’ve filmed for corporate videos in there, I’ve thrown a Ladies Only beer party in there and The Hubz & I had our some of engagement photos taken in there. I rest my case! Atmos? Ridiculously high ceilings, it actually has the feel of the catholic cathedral I got married in. You have to be in it to believe it. 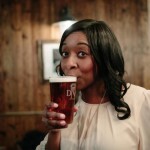 So don’t just sit there, go to the Old Joint Stock. 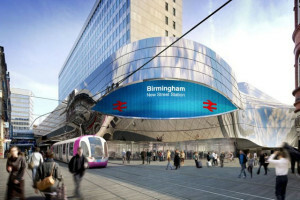 So what do you think about Birmingham no longer having a station tap? 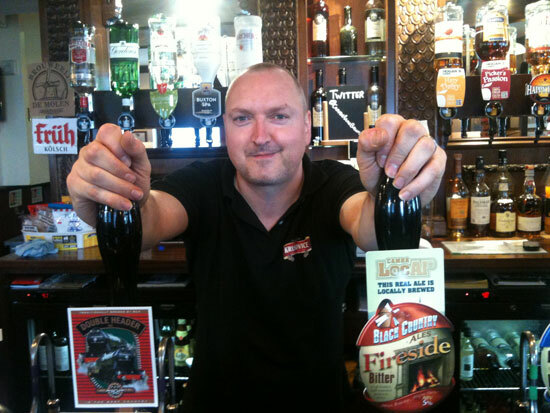 Can you recommend a brilliant station tap you know and why? Can you add any more to my list? Get in touch – Tweet me or drop a note on my Facebook page. CHEERS TO STU DAVIS FOR THIS GREAT MAP TOO! Fabulous idea for a blog post. 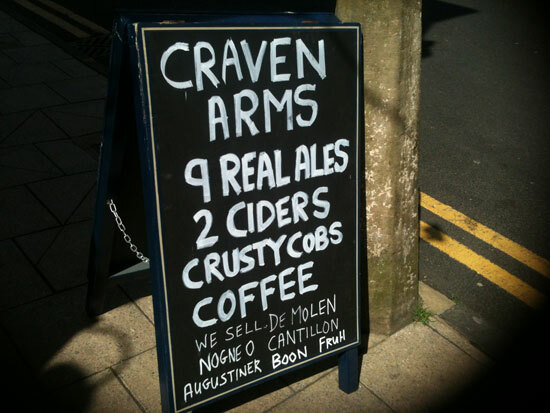 A great read, great pubs and even better ale. Thanks for introducing me to Citra, delicious! 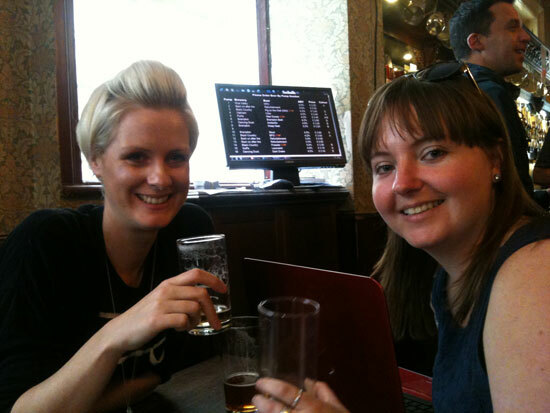 I would like to point out that Sarah and I were actually working and not just enjoying the delights of the Wellington! You can even see the laptop in the picture. 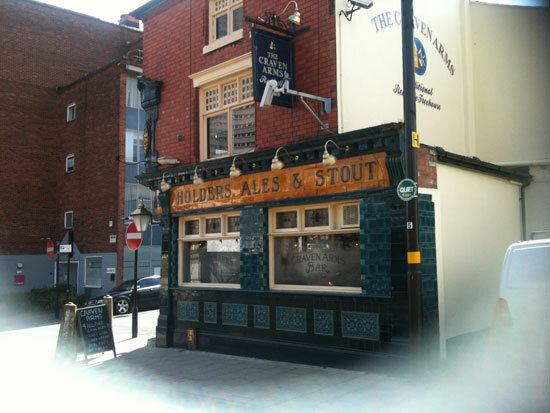 Really good guide to Pubs in Brum, I will be visiting some of these when I get some spare time, the Craven Arms looks like its definitely worth a visit. 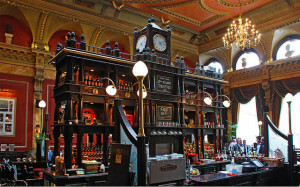 Don`t forget ‘The Old Contemptibles’ and Birminghams nicest pub ‘Bacchus Bar’.